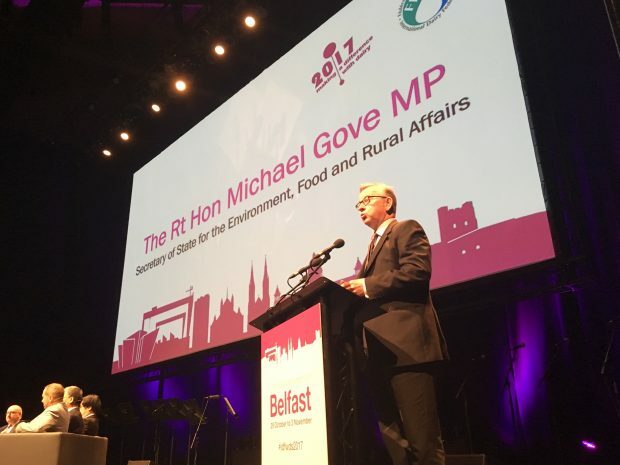 Environment Secretary Michael Gove is in Belfast today, speaking at the World Dairy Summit 2017. While at the summit, he announced the opening of a £40 million grants scheme to help the food and farming industry boost productivity by investing in new technology and equipment. Later he will meet with environmental groups from across Northern Ireland to discuss how the UK can better protect and enhance the natural environment outside the EU. Farmers truly are the backbone of our rural economy and as the original friends of the earth, we want to support them to grow more, sell more and export more great British produce – all while doing good for our environment. This new funding is a wonderful opportunity for our farmers and food processors to invest in the technology they need to boost productivity, competition and, of course, sustainability as a key factor in future proofing our world leading food and farming industry. Today Defra, the Foreign Office and DFID will launch the London 2018 Illegal Wildlife Trade Conference, with less than a year to go before the global conference begins. Defra, Foreign office and DFID ministers will bring together NGOs, academics and key countries affected by the illegal wildlife trade (IWT) to call on them to work with the UK to help stamp out this crime. It is now the fourth most lucrative transnational crime in the world after drugs, weapons and human trafficking. Building a strong, global consensus on tackling IWT is a priority for the Government as this crime, which is destroying entire populations of endangered species and causing misery for local communities, can only truly be addressed through international collaboration. Earlier this month the Government announced new plans to ban ivory sales in the UK. The UK government has also committed £26 million between 2012 and 2020 to fund practical action around the world to help fight the illegal wildlife trade. This includes, to date, 47 projects funded through the Illegal Wildlife Trade Challenge Fund. The international community shares a common aim to end merciless poaching and criminal trading - but now is the time to step up decisive action. Building on the success of past summits to protect critically endangered species, the London conference marks a collective intent to work together, share learnings and forge new partnerships to disrupt the criminality that is destroying flora and fauna on an unprecedented scale.